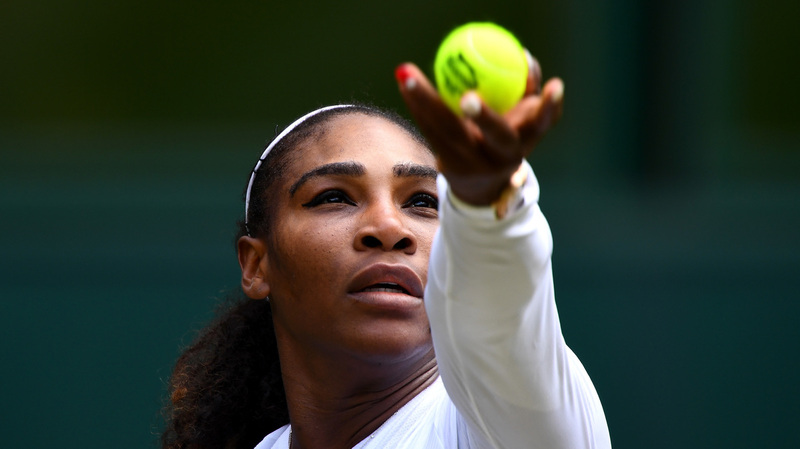 What Will Serena Williams Serve Us At Wimbledon This Weekend? After a year in which she has dealt with some health scares, Williams reclaimed her fitness and her game. She is favored against Angelique Kerber to win her eighth Wimbledon singles title. 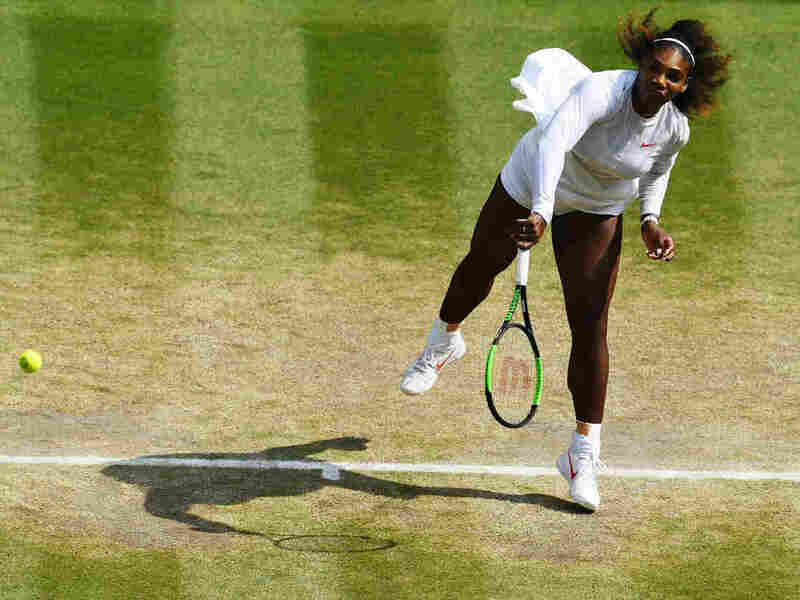 Serena Williams serves against Evgeniya Rodina of Russia during their Ladies' Singles fourth round match on day seven of Wimbledon on July 9, 2018 in London. Yet even a veteran tennis writer such as Wertheim, who's in London covering the tournament, is surprised. Very surprised. "In a macro sense, what she's doing is remarkable," Wertheim says. "She gave birth less than a year ago, it was a difficult pregnancy, she's almost 37 years old." For those who don't have access to HBO, or haven't paid attention to the last year's news about the world's greatest female tennis player, here's a rather harrowing recap. And then "everything went bad," Williams said in a January 2018 Vogue interview. She developed blood clots in her lungs, went through multiple surgeries and was bedridden for a month and a half. "Every tournament is an opportunity for me to better understand the areas I need to improve to be my best. Naomi [Osaka, who beat Williams] played a great match and I learn something each time I play. I look forward to continuing my return by progressing every day. I'm so grateful for my fans who continue to support me every step of this incredible journey." "She looked good, pretty good for a few matches," says Tom Perrotta, who covers tennis for The Wall Street Journal and 538.com. Williams dropped out of the French with a pectoral muscle injury, "but that [her performances before the injury] was a good sign," Perrotta says. "[Since then] she's had more time to practice and workout. She definitely looks a lot better than she has." Which brings us to the past two weeks in London. Williams came into the most famous tournament in tennis ranked an absurd 181st in the world, due to her long layoff and lack of great results. Wimbledon seeded her No. 25. As Williams started to work her way forward during the tournament's first week, the women's draw around her was experiencing a historic fail. All of the Top 10 seeds lost. "Certainly early on, the draw was her [Williams'] friend," says Sports Illustrated's Wertheim. "It's true she hasn't had to play a murderer's row of opponents. [But] I also think the level that she's brought to the court these last few rounds, it almost wouldn't have mattered who was on the other side [of the net]." "I think she might be somewhere from 80 to 90 percent back," he says, adding "she can play better than she's been playing. But for Serena, if she's serving well, which she has so far, that can be enough to win a tournament." Perrotta says in Williams' 6-2, 6-4 semi-final win over Julia Goerges of Germany, "she hit one serve 122 mph. So that means she's feeling more relaxed and going for it more and more and worrying less about [injury]. She seems to be loosening up and hitting bigger." Serena Williams of The United States serves against Julia Goerges of Germany during their Ladies' Singles semi-final match on day 10 of Wimbledon on July 12, 2018 in London. Which seems to be both good news and bad news for women's tennis. Good in that Williams is close to being all the way back and dominating her sport unlike any other athlete. Bad, in that it makes one wonder what will be left of the women's tour once 36-year-old Williams retires? All the upsets in that first week of Wimbledon generated a lot of talk about what they represented. A tremendous parity in the women's game? Or the absence of consistent challengers to Williams' reign? "We're all trying to figure out how to frame this," Wertheim says. "Is it 'this is great, any given Sunday? [the NFL analogy that anyone can beat anyone at any time]' Or a more fundamental issue?" "Martina [Navratilova] had a very interesting theory she put forth to me. [And she] is not someone known for regressive views, certainly not on gender," he continues. "But she thinks there is so much being done for these female players now – they have masseuses and coaches and trainers and courtesy cars, and when they're actually on the tennis court and have to do their own decision-making, a lot of them retreat." "I think this is also where Serena distinguishes herself. [Especially] in tight situations," Wertheim says. "This is when Serena's at her best. Late in the match or a critical point or it's 5-5 and you know Serena Williams is going to fight for every point." Saturday should be a competitive final, at least on paper, Wertheim says. Kerber, 30, is a veteran player who's won two Grand Slam titles – in one of them, the 2016 Australian Open, she beat Williams in the final. "I don't want to limit myself," Williams said this week about tying Court. "I think that's what I was doing in the past, I was limiting myself. I want to get as many as I can, starting with – I still have a match to win, so I'm not even there yet." If she gets there, "I think it's a stupendous, amazing accomplishment," says Tom Perrotta.